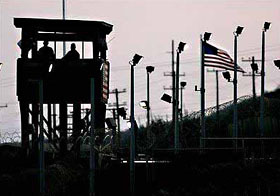 Obama administration officials said Monday they would not meet self-imposed deadlines for deciding what to do with scores of detainees too dangerous to release from the prison in Guantanamo Bay, Cuba. decided that dozens of detainees were eligible for transfer to other countries or were suitable for trial. But the officials acknowledged that two reports that were supposed to be delivered to the president by Wednesday — one on how to overhaul the nation’s detention policy and another on interrogation policy — would not be ready….”We want to get this right and not have another multiple years of uncertainty,” one senior administration official said in a background briefing with reporters at the White House. Well, that’s probably right. It is a complex problem, and they do want to get it right. But it’s not really as complex as all that, and there’s a far more likely explanation for the delay: after the bipartisan meltdown when this first surfaced in May, Obama realized that it’s a political issue so explosive that it could easily derail his entire domestic agenda if he lets it detonate in public again. Passing healthcare reform and climate change bills will be hard enough as it is, and he’s probably made a cold-blooded calculation that it’s better to slow-roll Guantanamo than it is to endanger either of his centerpiece domestic initiatives. It’s not pretty, but it’s politics.